HOUSTON (AP) — Chris Paul is quickly getting adjusted to the up-tempo, high-volume offense under Mike D’Antoni’s Houston Rockets. Paul had 11 points, 12 assists and four steals to lead the Rockets to a 144-82 exhibition victory over the Shanghai Sharks on Thursday night. Paul, acquired from the Los Angeles Clippers in the offseason, played 26 minutes and rested the fourth quarter as the Rockets cruised to victory over the overmatched Chinese team. Paul said D’Antoni drew up a play on Thursday night where he was coming off a screen to catch and shoot. He said he couldn’t remember the last time that happened. Trevor Ariza led Houston with 18 points, and James Harden had nine points, 10 assists and two blocks. Eric Gordon had 17 points, and Clint Capela had 16 points and 11 rebounds in 19 minutes. Houston jumped to a 43-16 lead after the first quarter, making its first seven shots and 13 of 29 3-point attempts in the first half. The Rockets shot 42.3 percent from beyond the arc overall. Houston opens the regular season at Golden State to face the defending champs. Rockets 21-year-old Chinese rookie Zhou Qi scored eight points, including a thunderous dunk, in 12 minutes. The 7-foot-1, 210-pound center played last season for the Xinjiang Flying Tigers of the Chinese Basketball Association after the Rockets drafted him with the 43rd overall pick in 2016. Josh Akognon led Shanghai with 27 points, and Nick Minnerath had 22. Shanghai shooting guard Jimmer Fredette watched the game from the bench with a knee injury. Fredette, who was named the regular-season international MVP last year while averaging 37.6 points, agreed to a new deal with Shanghai in July. Sharks: Shanghai lost last year’s exhibition game to the Rockets at the Toyota Center 131-94 behind 33 points from Fredette. … Shanghai was outscored 62-30 in the paint and 21-4 in transition. Rockets: Power forward Ryan Anderson (right hip contusion) and center Tarik Black (left knee soreness) were both out with injuries. … Veteran offseason additions P.J. Tucker and Luc Mbah a Moute provided a glimpse of Houston’s new-look improved perimeter defense. Tucker had four steals in 21 minutes, while Mbah a Moute had 12 points in 16 minutes off the bench. With both Paul and Harden registering double-digit assists on Thursday night, D’Antoni was asked if he imagines that will happen often in the regular season, with both players putting up that stat line in sharing the ball. When Paul was asked the same question, he said he wasn’t interested in the assists stats as long as the ball movement is good and the team is winning. Paul said he has had conversations with Rockets center Clint Capela, encouraging him to be a more vocal leader on defense and having confidence in his abilities. He uses former teammate DeAndre Jordan as an example of how an athletic big man can transform a defense as a vocal leader. Sharks: Begin their Chinese Basketball Association season Oct. 22 at Guangzhou. 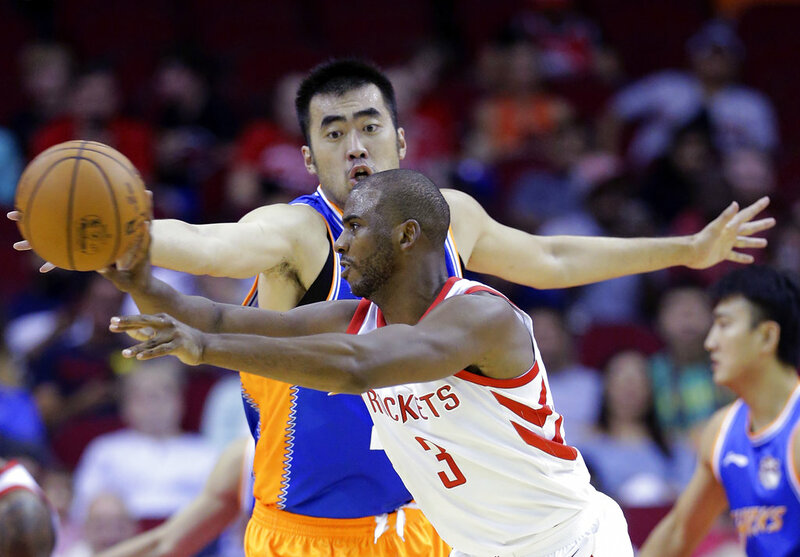 Rockets: Visit the New York Knicks on Monday night for their third of five preseason games. Tags: Chris Paul, Houston, Rockets, zhouqi. Bookmark the permalink.